When it comes to buying fish at the supermarket - assuming yours has anything that isn’t dull-eyed and tired - generally we remain creatures of habit. Cod. Haddock. Salmon. Tuna. Those four make up the bulk of what we buy, by far. That’s a shame because, as they say, there are a lot more fish in the sea. And if we spread our tastes a bit wider, it would be a boost to the sustainability of all of them. Hake is one of those alternatives. A tasty white-fleshed fish that can stand alongside cod, but is considerably less bought by British shoppers. 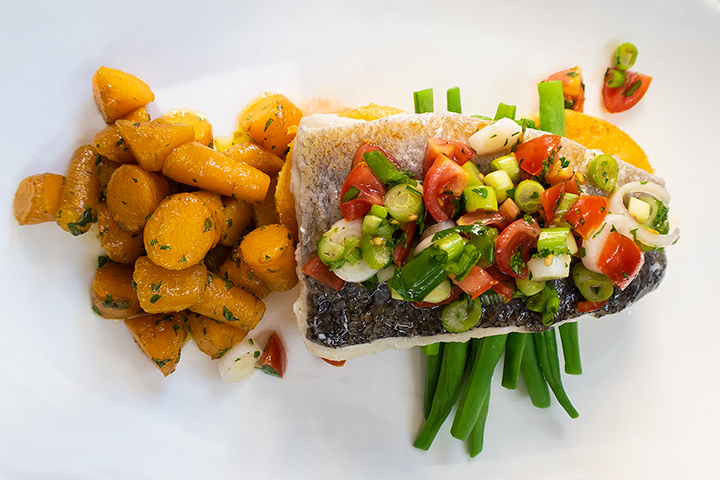 In 2014, the National Federation of Fishermen’s Organisations declared hake to be the UK’s most sustainable fish. That’s a good sign, although I would still seek out MsC certified fish, as always on such things. Hake is used in the UK more for products like fish fingers (and, by way of contrast, is popular on fish counters in parts of Europe) and so it is heavily targeted by fishing boats. What is sustainable one year can be very different a short time later, so always check for the latest information. I was in the supermarket for this meal looking at the options available, and I just decided that today would be hake’s day. It’s not a fish I’d cooked for myself before. I decided to cook it with a tomato salsa and with glazed carrots. A simple, light, pretty healthy meal. You do need to take some care - as always - in the cooking of the fish to make sure it’s perfectly cooked, and similar care as it happens with glazing the carrots. But those are just points of keeping your concentration rather than anything too onerous. To make the tomato salsa, mix together the tomatoes, spring onion, two-thirds of the parsley, the sugar, lemon juice and the white wine vinegar. Mix together thoroughly and then chill until needed. Cut the carrot into smallish pieces roughly the same size - you can use an oblique cut to make them look good, cut on an angle, and then turn the carrot 180º for each subsequent cut. Put them in a pan large enough that there’s plenty of space between them and they’re not all piled on top of each other. Add the sugar and enough water to cover, then add the butter and turn the heat up to high. Cook the carrots stirring them and moving them frequently so that, as the water evaporates they will be left with a buttery glaze. You want the carrots to be perfectly cooked - so they are soft - but you don’t want them to caramelise. Add a little extra water if the water evaporates before they’re fully cooked. Towards the end, you will want to turn the heat down to medium to ensure you don’t overdo it and end up with browning. Have a large pan of salted water at a rolling boil ready for the green beans. When the carrots are nearly done, heat a frying pan large enough to take both fillets and add a little oil. Sprinkle a little sea salt on the fillets and place in the pan skin side down. Fry over a medium heat for three or four minutes until the skin is golden and the flesh is cooked about two-thirds of the way through. At that point, flip the fillets carefully over and cook on the other side for barely a minute. Also add the green beans to the boiling water. Remove the fillets from the pan when they’re cooked. After two minutes in the boiling water, remove the green beans and drain. To serve: Place a pile of the green beans on the plate. Top with the fish and spoon some of the tomato salsa on top. Stir the remaining parsley in with the carrots, and then put a little mound of them at the other end of the plate. You’ll have left over lemon juice. I would put this into ice cube trays and freeze it, ready to be dropped into future meals that need a bit of additional seasoning.